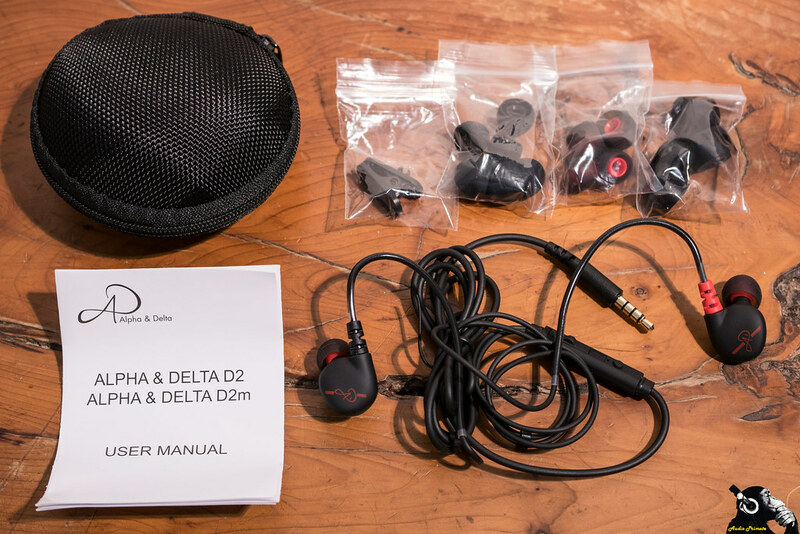 The Alpha & Delta D2M was supplied by Alpha & Delta, I do not have to return it after the review. I have not been paid for this review. The views are are my own. 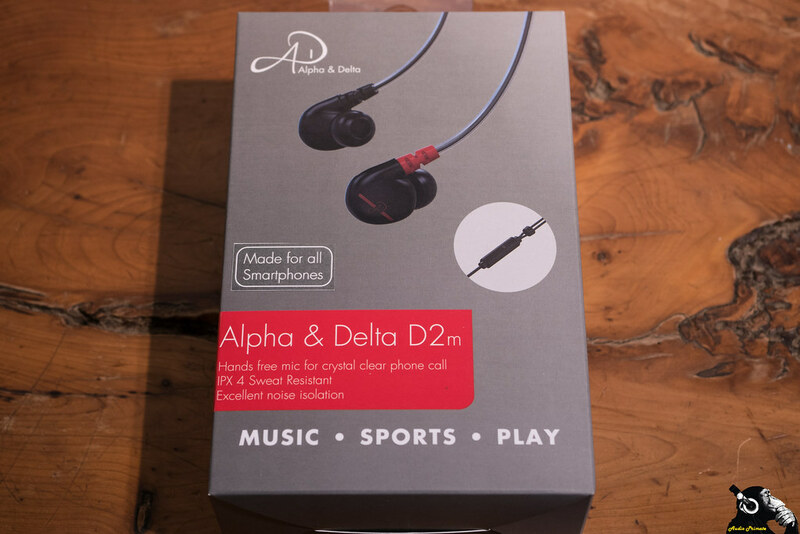 The Alpha & Delta D2M comes in a box that looks about the right size and appearance to be in an airport shop. I haven’t seen these in an airport shop, and they should be. Get on it Alpha & Delta! 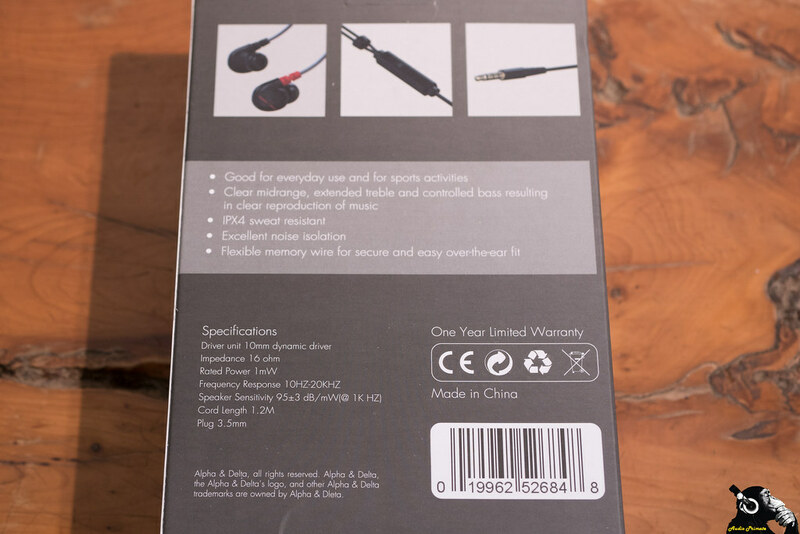 The exterior of the box has specifications and a little bit of blurb about the headphones, there’s nothing too ad-speak in the phrasing, which makes me happy. The box is to a generally good retail standard. Inside the box we have a simple plastic tray holding the semi-hard case (Yes!) and the manual and accessories. The variety of accessories is excellent for this price bracket: 6 pairs (S/M/L) silicone tips in 2 varieties, 2 pairs foam tips (M/L), a shirt clip, and the aforementioned case. These are IPX4 water resistant, which means you can go for a run in the rain or just be all sweaty and these will be fine. That’s a killer selling feature in a $25 IEM. The fit on these was excellent, on me, but one of my office mates didn’t have as good a match with the nozzle angle. So far he was the only one. All the strain reliefs are really robust. These look like they will be very durable headphones, which is good considering how much abuse $25 headphones usually take from their owners. I know too many people who buy 3 pairs of IEMs a year because they buy easily breakable headphones. They should buy these instead. The thin pre-formed plastic sheathing for ear hooks is one of the most effective implementations I’ve seen. It’s lightweight, so it doesn’t irritate the top of my ear like memory wire, and it keeps the IEMs in place well. For sound impressions on the Alpha & Delta D2M I used mostly my phone, with some use on the HiBy R3, the Shanling M2S, and the Audio Opus Opus #3. As these are just initial impressions, not a review, I didn’t note which source I was listening to in my notes and didn’t do volume matching. I can say they performed well on all sources. I didn’t burn these in, but they have gotten quite a bit of play. I liked using these IEMs quite a bit. Actually, I shared these with other people a lot too. These are quite popular around the office, 3 people have bought them. The mids are clear and left alone by the mid-bass. I don’t get any bleed with these. The treble is smooth, and not particularly sparkly. I don’t think this will be overbright for anyone. The soundstage isn’t big in width or depth, but instruments within it are portrayed in an accurate manner both by tone and by expected location, for the most part (midbass already mentioned as slightly forward). 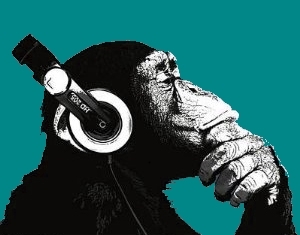 Tonally everything sounds really good. Instruments sound accurate with a balanced presentation. The signature on these is kind of an everyman signature. 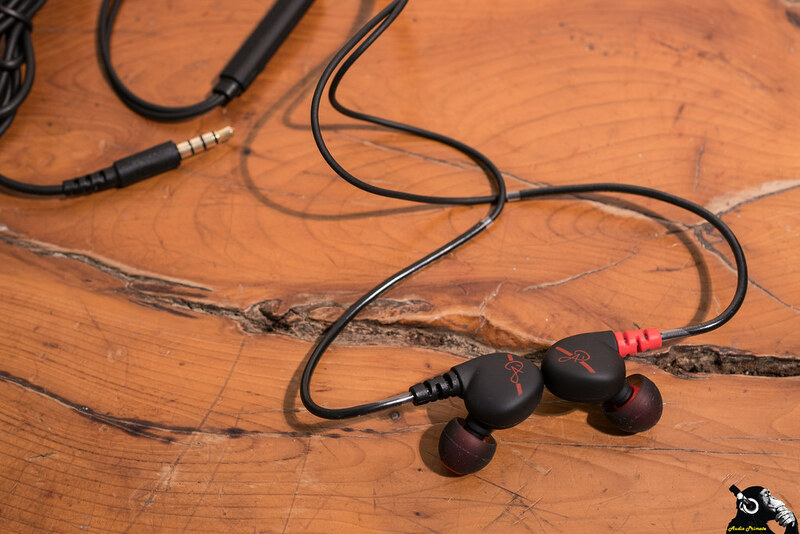 It has that little bit of extra midbass that consumers crave, but has far clearer mids that allow them to hear more of the music than they have with their essentially disposable IEMs do. The treble shouldn’t be interpreted as sharp by anyone. Right now, these are definitely one of my top performers in the $25 bracket.